The summer is now sadly drawing to a close and we have just two more concerts to go. 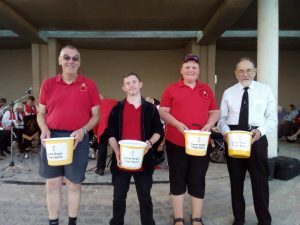 On Sunday afternoon we will be playing on the seafront as part of a programme of musical entertainment organised by the Rotary Club, who are running Candles on the Cobb this year. We will be playing from 3.00 pm. Our final concert will be on Tuesday, 28th August at 8.00 pm. Last Tuesday it was dark by the time we finished playing but the moon came out and lit up the bay as we packed up our gear. We are so lucky to have such a beautiful venue for our concerts. We were very pleased last night to welcome another guest player to our ranks – Julie, who plays for Sherborne Brass Band, joined us on flugel. We’ve been really lucky this year, with so many guest players sitting in with us for the season including Bridget on horn, Jo on Euphonium, Geoff and Brenda on cornet and John on bass. We are very grateful to them. We must also thank our “fab four” who have turned out every week to collect for us. As we rely on the money we collect in the summer to pay our overheads in the winter their efforts on our behalf are greatly appreciated. In the photo they are, left to right, Ralph, Robert, Josh and Peter. Finally, last night’s concert went really well. The highlight of the evening was when we played Rock around the Croc. Yet again Ellis did sterling work encouraging children of all ages, from seven to seventy, to grab a percussion instrument to try and drown out the band. It was a close run thing – hard to tell – but we all made a fantastic noise between us! On a sad note, Jane, one of our baritone players, has decided to leave the band having played with us for over eight years. Jane lives in Yeovil so has travelled a considerable distance to be with us, often undertaking difficult journeys to get to rehearsals in the dark winter evenings. Apart from being a valued player for many years Jane taught our trainees and has introduced many young people to playing a brass instrument. We will miss Jane but she intends to continue playing with a band closer to where she lives, which is good news.